The Birds of America, a book of 435 images, portraits of every bird then known in the U.S.
1804 Meets and falls in love with Lucy Bakewell, daughter of neighbor William Bakewell in Mill Grove. Creates wire constructions that help him pose dead birds in lifelike positions to paint them. 1808 Marries Lucy Bakewell and moves with her to Louisville. 1810 Meets ornithologist Alexander Wilson, and declines to subscribe to his publication, American Ornithology. Moves to Henderson, KY with family. 1816 Invests in steam-powered grist mill in Henderson. 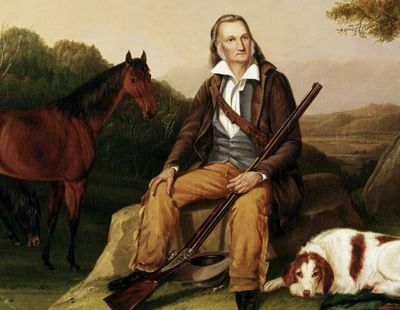 1819 Samuel Adams Bowen attacks Audubon on the street; Audubon stabs him in self-defense. Business fails. Jailed for debt; released when he files for bankruptcy. Family loses all possessions. Daughter Rose is born. 1820 Daughter Rose dies. States intention to complete, in his lifetime, “a collection of the Birds of our Country, from Nature, all of Natural Size”. 1821 Arrives in New Orleans and begins portrait painting on the street. Wife and sons join him in December. 1824 Attempts to obtain support from the Academy of Natural Sciences in Philadelphia for a publication of his engravings of American birds. Opposed by George Ord, editor of American Ornithology by Alexander Wilson. 1826 Leaves for England. Gains success quickly. Exhibits 250 paintings at the Royal Institution at Liverpool, Manchester, and Edinburgh. 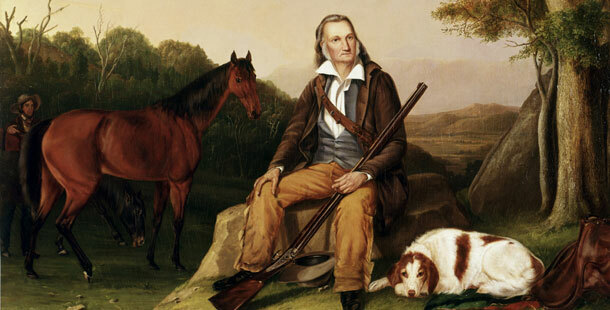 Meets William Home Lizars, who agrees to become Audubon’s engraver. 1827 Hires London’s Havell & Son to work on Double elephant Folio etchings. 1829 Returns to America to paint more American birds and convince Lucy to join him in England. 1830 Dines at the White House with President Andrew Jackson. 1831 Publishes first volume of Ornithological Biography. 1833 Travels to Labrador to paint northern bird species. 1838 Fourth and final volume of the Folio edition of Birds of America is completed. 1839 Leaves England for good to settle in New York with Lucy. Begins planning for The Viviparous Quadrupeds of North America. 1840 Begins work on octavo edition of The Birds of America. 1841 Purchases Minnie’s Land, a 30 acre estate in Upper Manhattan. 1843 Travels west to search for new specimens for Quadrupeds. 1845 First Imperial Folio volume of The Viviparous Quadrupeds of North America is published. 1848 Suffers stroke. Eyesight has now failed and son John Woodhouse has taken over work on Quadrupeds project. Audubon begins to go senile. 1851 Dies at Minnie’s Land on January 27.